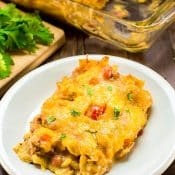 King Ranch Chicken Casserole is a creamy, cheesy, vintage Tex-Mex or Mexican Chicken Casserole with layers of tortillas and chicken in a creamy sauce and covered with melted cheese! 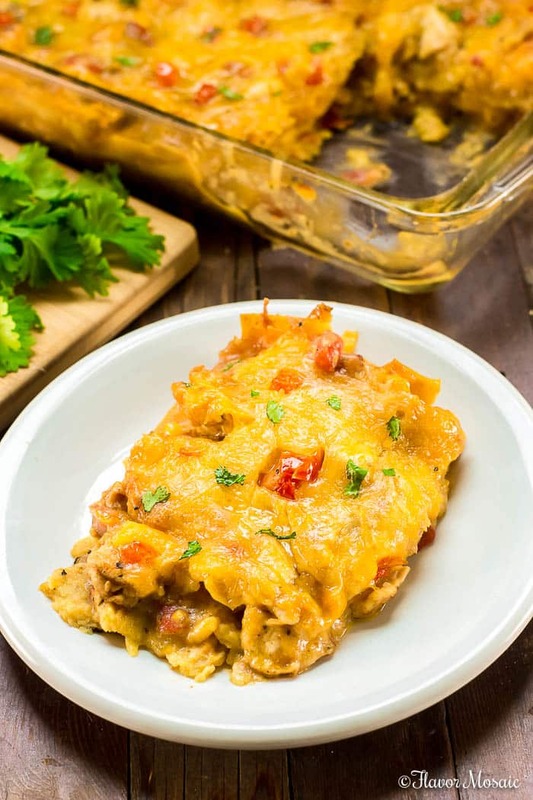 Having grown up in Texas, this King Ranch Chicken Casserole was a family favorite Mexican chicken casserole in our house, as it was in many families, especially those in Texas. If there were an official state casserole of Texas, it would be this King Ranch Chicken Casserole. 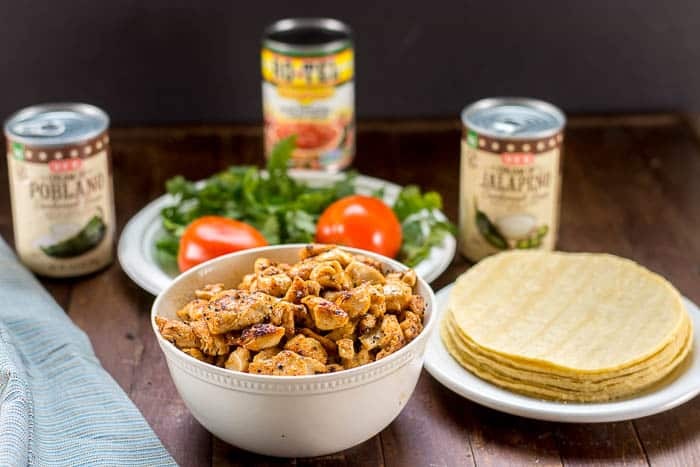 Technically, it would be more Tex-Mex than Mexican, but no matter how you categorize it, it is a delicious chicken casserole that has been a family favorite in many families for decades. Where Did King Ranch Chicken Casserole Get Its name? The history of the King Ranch Chicken Casserole is not really known. It is assumed that it is named after the King Ranch in Texas, but they don’t claim it. They are known for their beef, not chicken. Maybe a ranch cook or one of the ranch hands families created it? However, no one really knows. To whoever created this famous casserole, Thank you!! According to Houstonia Magazine, it is believed that this dish dates back to the 1940s or 1950s. What Are The Ingredients For King Ranch Chicken Casserole? Cooked Chicken – See below for the types of chicken that work well in this recipe. Canned Cream of Chicken Soup – This is typically what is used but I substituted Cream of Poblano Soup for mine that I found at my local Texas grocery store. Canned Cream of Mushroom Soup – Again, this is traditionally what is used in the casserole but I used Cream of Jalapeno Soup instead. Can of Diced Tomatoes and Chilies (Like RO*TEL) – If you can’t find this, you can use 1 can of diced tomatoes and one can of green chilies. Tortillas – Traditionally, corn tortillas are used but you can use either flour or corn tortillas. 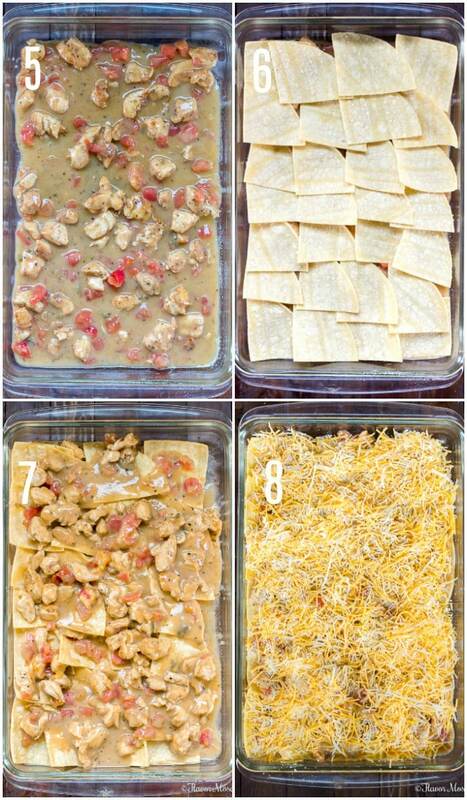 What Type of Chicken Should I use in the King Ranch Chicken Casserole? Cooked Chicken is what is required for this casserole. Do NOT put raw chicken in this casserole. This can be any one of the following. A home-cooked whole roast chicken, such as my Crock Pot Roast Chicken, or my Oven Roasted Chicken recipe. 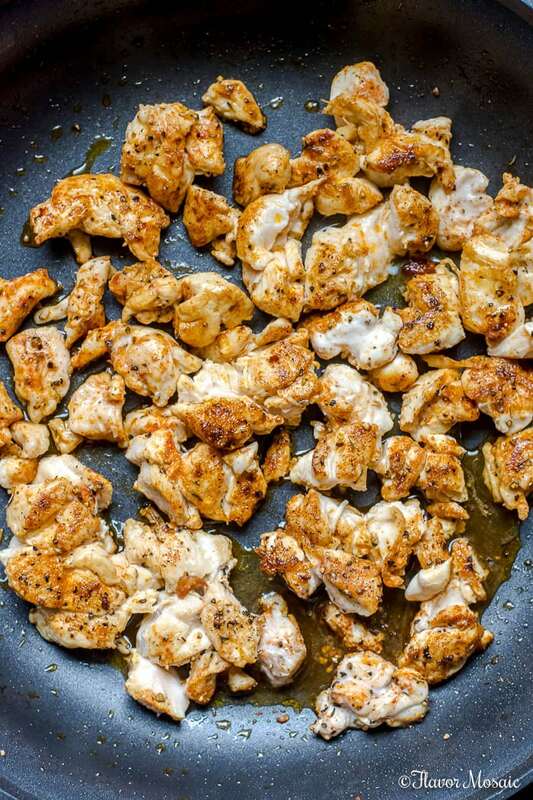 Boneless, skinless chicken breasts that you cooked. Any of the following chicken breast recipes would work. Pan Seared Herb Roasted Chicken Thighs. 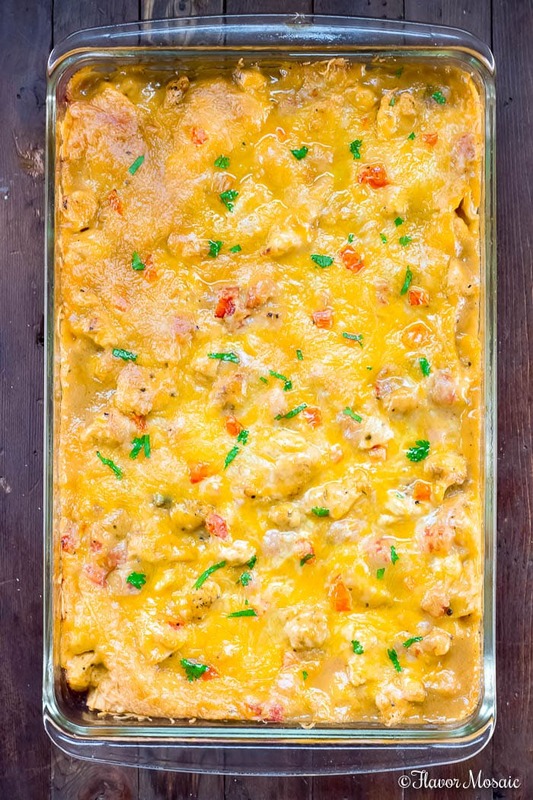 How Do I Make King Ranch Chicken Casserole? This King Ranch Chicken Casserole is very easy to make. 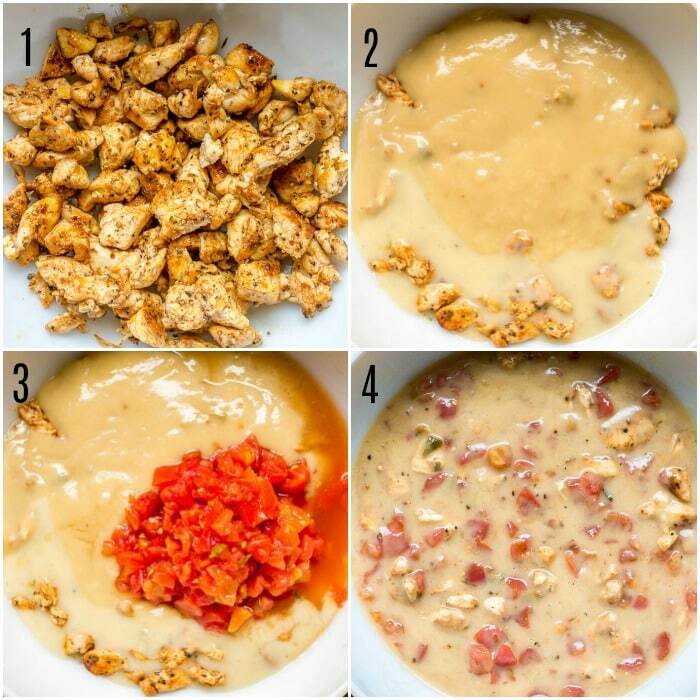 The creamy chicken filling can be made in 4 simple steps as shown in the step by step photos below. Place your cooked, seasoned chicken in a bowl. Add the diced tomatoes and chilies. How Do I Assemble The King Ranch Chicken Casserole? 5. Pour 1/3 of the creamy chicken mixture, prepared above, on the bottom of a 9×13 pan sprayed with cooking spray. 6. Layer corn tortillas (cut into quarters) over the creamy chicken layer. 7. Layer half of the remaining creamy chicken mixture over the tortillas. 8. Top with half of the shredded Cheese. How Long Do I Cook King Ranch Chicken Casserole? After you have assembled the King Ranch Chicken Casserole, bake it in a preheated oven at 350 degrees for 30 to 40 minutes. Use Seasoned Chicken in the recipe. The more flavor your chicken has, the more flavor the casserole has. If your leftover chicken is not seasoned, add a tablespoon or two of your favorite seasonings, such as taco seasoning or fajita seasoning. Bake covered for the first 20 minutes and uncover for the last 20 minutes so the cheese on top does not get overdone. Extra Cheese Please! The recipe calls for 2 cups of cheese, but if you are like me and love cheese, go ahead and add some extra shredded cheese on each layer to make it extra cheesy. Allow the casserole to cool for about 10 minutes to allow the creamy chicken filling to firm up. What Are Some Variations of the King Ranch Chicken Casserole? Variations of this King Ranch Chicken Casserole abound. Here are a few popular variations. Add chopped onions and bell peppers. Change up the soups. My grocery store has canned Cream of Poblano and Cream of Jalapeno soups, which I loved for a change of pace. Use a different type of chicken. If you used a rotisserie chicken last time, try using Cajun Blacked Chicken this time! Add 1 Tablespoon of Taco seasoning to the canned soups and canned tomatoes and chilies. Use flour tortillas instead of corn tortillas. 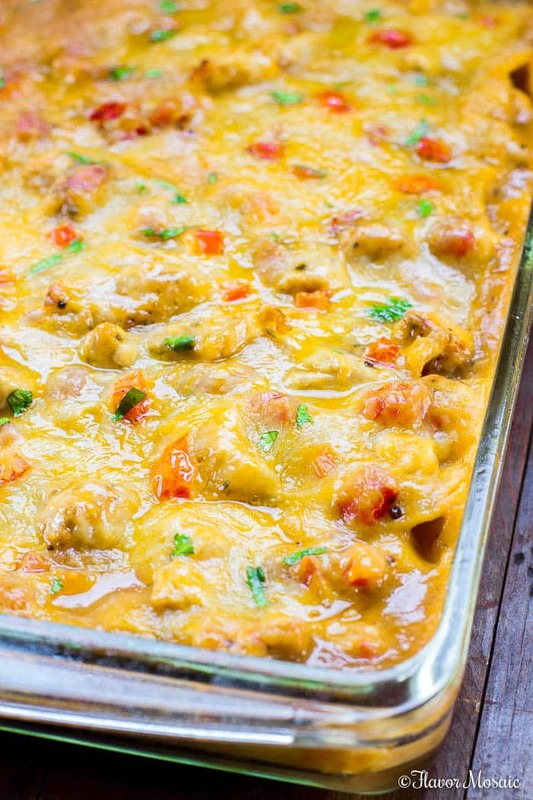 Can You Freeze King Ranch Chicken Casserole? Yes! If you have freezer space, assemble 2 casseroles at once and bake one and freeze the other to cook later. What Do You Serve With King Ranch Chicken Casserole? I like to serve it with a salad and Mexican cornbread or this Black Bean and Feta Cheese Ugly Dip. When Do You Serve King Ranch Chicken Casserole? Serve King Ranch Chicken Casserole for a family weeknight or weekend dinner. You can make this casserole ahead of time so it is great to take to family reunions, potluck suppers, church socials, etc. What are Some Similar Casserole Recipes? Taco Lasagna – Taco Lasagna is a traditional lasagna casserole with lasagna noodles but adds Mexican taco seasoning, enchilada sauce, and Mexican and Cheddar cheese that is sure to be a family favorite. 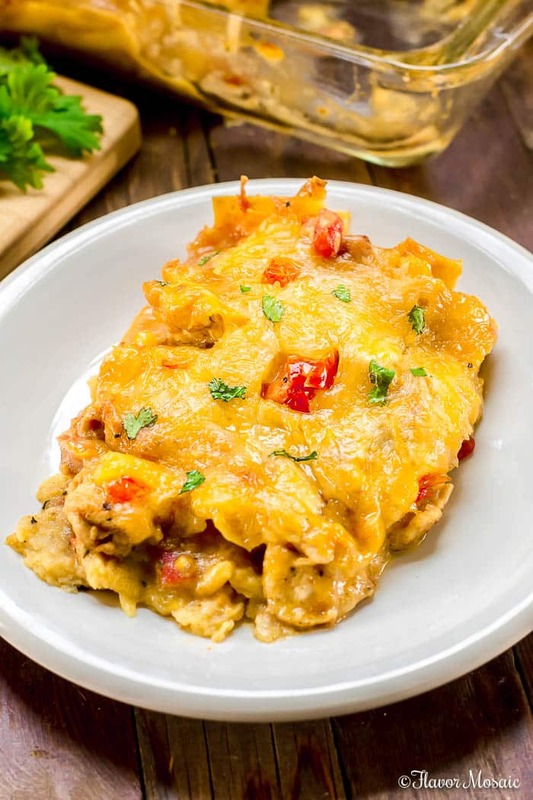 Chicken Enchilada Skillet Casserole – This quick and Easy Enchilada Skillet Dinner is great for an easy delicious weeknight meal. Easy Chicken Pot Pie Casserole – The Easy Chicken Pot Pie Casserole recipe is one of the most popular dishes in the country. Why not? With it’s flaky, buttery crust and creamy, savory sauce covering diced chicken, celery, onions, potatoes, carrots, and peas, even kids love it. Cheesy Chicken Bacon Ranch Pasta Casserole – Cheesy Chicken Bacon Ranch Pasta combines lots of my favorite flavors, such as bacon and ranch, into a creamy, cheesy, comforting chicken and pasta baked casserole. Chicken Broccoli Cheese Quinoa Casserole – a twist on a favorite classic comfort-food casserole, Chicken Broccoli and Rice Casserole, because instead of rice, it uses high-protein, gluten-free quinoa to make it healthy yet delicious. Preheat oven to 350 degrees F. Spray a 9x13 casserole dish with cooking spray. Place your cooked, seasoned chicken in a bowl. To assemble the casserole, pour 1/3 of the creamy chicken mixture, prepared above, on the bottom of a 9×13 pan sprayed with cooking spray. Layer corn tortillas (cut into quarters) over the creamy chicken layer. Layer half of the remaining creamy chicken mixture over the tortillas. After you have assembled the King Ranch Chicken Casserole, cover and bake it in a preheated oven for 20 minutes. Then uncover and cook for another 15 - 20 minutes.